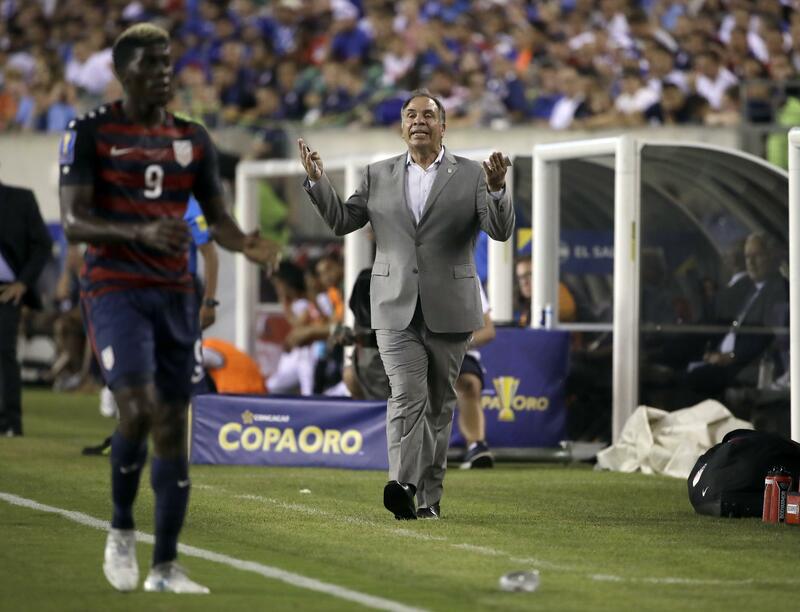 Bruce Arena blends intense demands with humor to lead U.S. Tue., July 25, 2017, 2:55 p.m.
SANTA CLARA, Calif. – Bruce Arena bites his fingernails religiously, a habit he has had since age 10. Arena walks across midfield soaking in the California sun and surveying the scene as his players take a lap and begin stretches ahead of training on a practice field adjacent to Avaya Stadium, home of the San Jose Earthquakes. He crosses his arms and paces – side to side, forward and backward – eyes up always. He shifts his hands to his hips and steals a glance downfield to where the goalkeepers are doing individual work. With his quick wit off the field and demanding nature on it, Arena has instilled a calm and a swagger the U.S. squad needed, and that has bred success again after fans reached panic mode. Now, Arena can become the first to coach three CONCACAF Gold Cup titles if the Americans can beat surprising Jamaica on Wednesday night. The U.S. won under Arena in 2002 and `05. On Monday, Arena reminded his players it was here in the Bay Area where the Americans regained momentum in March by beating Honduras 6-0 in a World Cup qualifer. Arena, a member of the U.S. Soccer Hall of Fame who turns 66 in September, has led the team to an 8-0-5 record since he returned in November for a second stint as coach, replacing Jurgen Klinsmann after the Americans’ first 0-2 start in the final round of qualifying in the North and Central American and Caribbean region. The U.S. is seeking its sixth Gold Cup title and first since 2013. Nine different players have scored so far this tournament, most notably Clint Dempsey’s record-tying 57th goal in a 2-0 semifinal win against Costa Rica on Saturday that matched Landon Donovan’s mark. “Coming into the situation, into the job, we were in a tough spot,” Dempsey said. Under Arena, the Americans have momentum again regardless how Wednesday turns out. Qualifying resumes with matches against Costa Rica on Sept. 1 at Harrison, New Jersey, and four days later at Honduras. The hex concludes against Panama on Oct. 6 in Orlando, Florida, and at Trinidad and Tobago four days after. Arena took over with little room for error. A decade ago, he never would have envisioned himself in this spot now. Published: July 25, 2017, 2:55 p.m.